Searching for an easy way to get the best out of your Behringer FCB1010? Don't look further, you came to the right place! Never thought programming the FCB1010 could be that easy. Try it out and never look back! 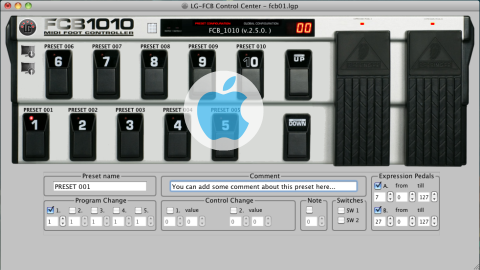 FCB/UnO Control Center lets you manage setups for the original FCB1010 and for the "UnO equipped" FCB1010. (see www.fcb1010.eu to learn about UnO) Both a native Mac version and a native Windows version are available. The editor design focuses on usability. It hides all of the technical details and lets you build your setup in an intuitive way. At all time you can review the programmed MIDI commands, and after downloading your setup the MIDI monitor allows you to compare what you programmed with the actual MIDI output of your FCB1010 in order to verify your downloaded setup. 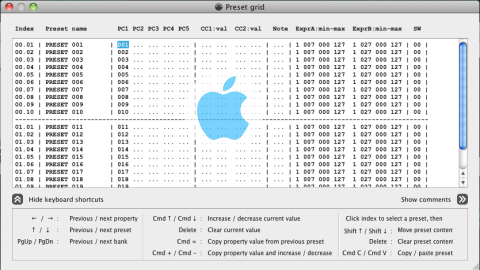 Today many FCB1010 users rely on this editor, and love it. Being around for many years the bugs have left the building long time ago. A free demo version allows you to verify MIDI communication with your hardware. 20 Euro is money well spent, when it allows you to focus on playing music! Q: When will I receive my license key? Right after payment a personal license key will be emailed to your PayPal address. If you don't receive it within a few hours after payment, check your email spam folder! Q: I didn't receive my license key and I did check my spam folder! What's up?? An increasing number of email providers are blocking all emails sent from the web servers of large hosting companies, because they think it might be spam. We are receiving many many emails from people who didn't receive their license email, while we are receiving the email copy as proof of transmission. If you don't find the license email in your local spam folder, you will most probably find it in the spam box of your online webmail account (which many people never visit). Q: I didn't receive my license key and your explanation above doesn't help me! What now?? If you can't access your blocked license email, just send us an email (contact info below) and we will forward the license data once more. Please be aware that we can follow up our mailbox after working hours only (Belgium time), so do not expect an immediate response. If you did not receive a reply after 24 hours, our reply must have been blocked too. Contact us again and we will keep trying using different sender email addresses until we get through. Q: What if I lose my license key? MAKE SURE TO SAVE A COPY OR A PRINTOUT of your license data. When you reinstall your computer you will need your license key backup to register the editor again. We do not keep track of license keys, so we can't recover a license key for you. Q: Can I use my license on more than 1 computer? Yes. You can reuse the same license data on up to 3 personal computers, Windows and Mac. Q: Can I sell or transfer my license to someone else? No. Your license is personal and cannot be transferred to someone else. Q: Will your editor work with my MIDI-USB interface? Now that's a good question. It is indeed a known issue that many MIDI-USB interfaces (especially the cheaper Chinese ones without specific driver) are not capable of transferring the large patchdump SysEx messages of the FCB1010. Therefore TRY BEFORE YOU BUY! 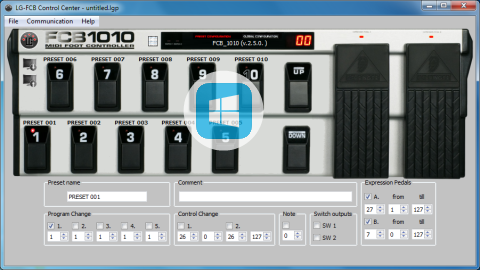 The trial version of ControlCenter allows you to establish a connection with the FCB1010 and upload its setup to your computer. When that works correctly, patchdumps will also work with your interface. Q: Which MIDI-USB interface do you recommend? Have a look in the Files section of the FCB1010-UnO Yahoo group It contains a database with user feedback about which interfaces do work for FCB1010 patchdumps and wich don't. Q: Where is the ControlCenter manual? Scroll down a little more. On the bottom of this page you will find the download link. Or here. Q: Where is the ControlCenter change log? MIDI simulator output : take into account the global setting "No PC repeats"
As much as we hate to be the RTFM guy, downloading the manual below is still the best way to find out about all possibilities and to get fully up and running in no time. If you still have questions after reading the FAQ above and the manual, please visit one of the FCB1010 Yahoo groups. That's the best place to meet other musicians who might use the same gear as you and have useful tips on how to program the FCB1010.